I’ve always been fascinated by Irish legends. It was number one on my bucket list to explore Ireland and get lost in thousand-year-old tales. When I went to Ireland for the first time I was surprised, utterly shocked at the notion that every local I asked about Irish legends offered a vague retelling of a random ambiguous place. I wanted some direction, but the only direction I was getting was the one leading me to our next pint. I was so frustrated! How in the world was I finding it so difficult to pinpoint places related to Irish legends when Ireland is exploding with them? Driving along the Wild Atlantic Way in the Connemara region. Here the mountain peaks are many and the valleys are deep. This coastal road hugs craggy cliffs and sandy shores, and it never gets old. I started to think there were no places in Ireland related to these legends outside of book shops and fireplaces. That was until I went on a journey along the Wild Atlantic Way. What I discovered was much more than what any local could ever share over a pint in Dublin. I found that the legends themselves lived in the very earth that I stood on, in every valley, on every cliff, and in every moss-covered woodland. They were intangible and scattered, they were literally everywhere. You can see the stone walls right to the cliffs. Imagine standing here, pelting winds and freezing sea spray. It’s harsh conditions like these that brought people to gather, warm by the fire, and tell stories to entertain. Now before you go mapping your itinerary, there is something you need to understand about Irish legends. For many years the Irish lived in very harsh conditions, especially along Ireland’s western coast. The earth was a crucial element to Irish Mythology with its irregular landscapes that spawned curiosities. Many Irish legends and myths were told to rationalize things the people could not explain, and often still can’t. With the western coast of Ireland being such an isolated land, these mystical, magical and enchanting stories were preserved well. They made a natural transition into modern times especially in the most distant parts of Ireland like Achill Island, the Connemara region, the Burren and the Dingle Peninsula. There are so many sites, monuments, and locations that are tied to Irish Legends I would have to write an entire book on my findings. From the magpies to the sea cliffs, tales of thousands years echo in the air. Here are 5 really cool, enchanting and stunning trips to take along Ireland’s Wild Atlantic Way that are rich in legend and will leave you mystified. I honestly never knew the water could be so blue in this part of the world. Keem Bay, Achill Island. Ireland is home to countless mystical monuments dating back thousands of years. According to Irish folklore the fairies dwell in these prehistoric megalithic sites. In part, this can be attributed to a means of rationalizing obvious questions regarding how were these were made and how they were placed along astrological alignments. That’s not to say if you asked around, you wouldn’t hear a tale or two about a malevolent fairy. Mermaid Legend – A man with family from Dooagh was thought to be a descendant from a mermaid. Legend has it that if you a mermaid sees you before you see her, you will soon be dead. These ancient sites of tombs, cairns, forts and mounds were also believed to be the entrances to Tir Na Nog (the Other World), a perfect place where no one fell ill or aged. Magical right? So why not set out and explore some of these ancient enchanted sites? With a sense of adventure, boots, and the desire to hike, you can take a tour of these places with the Achill Archaeological Field School. Like how cool is that? Gearing up with archaeologists to find enchanted prehistoric sites, yes please! Beautiful ruins are scattered all over Ireland. These stand next to Grace O’Malley’s Castle also known as Granuaile’s Tower at Kildavnet. The Banshee – A type of fairy that warns people of pending death in their family. It is said that she can be seen on the Sidh Groigin, the raised bog mounds which are NEVER ever cut by man. These are thought of as homes to the Banshees, and a sitting place for them to cry. Booley Sites – Remote sites known to be haunted by fairies, Banshees and even the Devil, and every local will tell you so. No one is brave enough to hike to the booley huts and spend a night. The Children of Lir – A tale of the four children of Lir banished by their jealous step mother for 900 years to 3 different places in Ireland, Lough Derravaragh, the Sea of Moyle and on the waters of the Bay of Erris near to Inishglora Island which borders Achill Island. Grace O’Malley the Pirate Queen – She’s known by locals as the, “Wild Atlantic Woman”. She braved the wild waters to the 15th century castle known as, Granuaile’s Tower at Kildavnet which, takes a seat to the stunning view of the Sound. If you’re looking for some local tales I can recommend you visit the Achill Island Hotel’s Pub and ask for Edward McNamara. He is the pub manager and just the right type of local to bring you into the legends of the land. During the season you can also enjoy the Pirate Adventure Park. This is a great stop off for kids to flip out and run themselves into a coma! WIN! Home to the Pirate Queen, you can visit the Westport House which was built on the ruins of Grace O’Malley’s home. With 30 antique rooms and hallways, a Grace O’Malley Exhibit and even a dungeon, this is an exciting place to explore for all ages. Check out their Pirate Queen Festival for a full on pirate experience. Driving through Connemara is like driving into “Neverland”. According to Irish Mythology, the Tuatha De Danann were a race of magical demigods born of the Goddess Danu. It is said that they came in from the western sea and succeeded the Fir Bolg on the shores of modern-day Connemara. A drive along the Sky Road will reveal a landscape portal for you to imagine the mythical invasion of these ancient people. The 7 mile loop at the foothills of the Twelve Bens Mountains is not only exhilarating, but enchanting. If you still have your boots on, you can brave the trails for an outdoor adventure. You will find that this region has some of the most breathtaking views that Ireland has to offer. This is the oldest court tomb in all of Ireland. I was taken here, to the cliffs of Cleggen Head by Archaeologist Gerry MacCloskey. Could this be the tomb of a lost soul of the Fir Bolg? Check out Walking Connemara, Brian Hughes and Gerry MacCloskey are amazing guides and can show you the most enchanting places off the beaten path. In Clifden Brian also runs the Abbeyglen Castle Hotel if you are looking for an enchanting evening to top your magical day in Connemara. Complete with dinner, pub and breakfast with a view of the mountains. The Burren is a vast sea of confusing and irregular limestone formations wrapped with ancient man made stone walls. There are so many ring forts here (thought to be where fairies live) that you can count them as you pass along. Visit the Poulnabrone Dolmen, a Neolithic portal tomb dating back between 4200 BC and 2900 BC. This is one of the few megaliths that actually have a car park. It is maintained by the OPW, (the Office of Public Works) because it is a protected site. Many believe it is a portal to the other world where fae live. To learn more about Ireland’s protected heritage sites click here. Near the Cliffs of Moher I love the Sea View House in Doolin and its owners Niall and Darr. This luxury B&B overlooks the Atlantic Ocean and is rich with comfort and Irish hospitality. This is the charming view from the balcony overlooking the tiny village of Doolin. It was so nice to rest here, exhausted from our adventurous journey, they treated us like family. And holy cow their beds are comfortable! Near Limerick in Newmarket-on-Trent I felt like an absolute princess at Dromoland Castle Hotel! I kept thinking, “I wish I was staying longer, this place is amazing!” This five-star property is a real life fairy tale. I’ll never forget this completely magical experience of elegance and luxury. A member of the exquisite Preferred Hotels & Resorts brand. 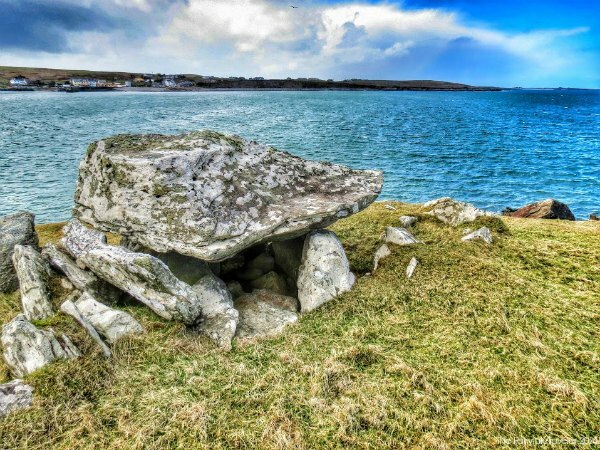 Much like Achill Island and the Burren, the Dingle Peninsula has a great deal of fairy legends that remain in the shadows of their dense population of archaeological sites. Dingle is one of those places where you can feel the echo of ancient Ireland in the sea sprayed air. Its sloping mountains, water-laced valleys, craggy sea-beaten cliffs and ancient ruins recall a much more tumultuous Ireland, one that gave a foundation for the very legends that we know and love today. For a scenic tour of the best of the Dingle Peninsula get with John and Elaine of Dingle Coastline Tours. They are amazing and know the area well. Plus, now that they have met me, they know exactly what you’ll be looking for! In Tralee If you’re looking for some extra enchantment why not try Ballyseede Castle Hotel just outside of Dingle. This finely appointed property is a member of the Manor House Hotels of Ireland and delivers excellence in both quality and service. It’s not stuffy at all. I totally felt like I lived there. We even walked around for a late night adventure in our pajamas! YAY!!! I am elated that you liked it 😉 Warm n fuzzy!! That is all I ever want to hear! I hope I can inspire everyone that reads this to take this trip. It’s completely unforgettable! What a great piece! When I was researching the West coast of Ireland it was really hard to figure out which areas to focus on– this is such a perfect guide! I loved Connemara (Neverland is a perfect description!) but there is so much I didn’t see. Next time I want to hit Dingle and see those magical beehives! Your photos are making ready to pack my bags! That is AWESOME!!! Thank you Kristin!! Do make lots of time for these places, they are all so amazing, I miss them already! There is so much more to know! If you get a chance, check out http://faemagazine.com and buy the downloadable magazine with my article about where the fairies are in Achill Island. It will blow your mind! xoxoxox Thank you for the kind words! I’m with Niamh on this too, I went to tonnes of these kinds of places as a kid, but i’ve sort of forgtten them at this stage! Need a re-intro. Niamh, let’s Ireland roadtrip? Oh I’m inspiring road trips now, well then. My job here is done! HA! I loved road tripping Ireland. There is so much to see, so many adventures to be had. Just roll with the wind and the beer! So. Much. Beauty! I love that sheep and his punk rock colours! Ha! SJ those sheep are NUTS!!! They defy death I swear it, on those craggy cliffs, it’s crazy! Oh Christa! What a beautiful post… I can almost feel as if I was on one of those windy moors, surrounded by banshees and demigods. I loved all the hotel recommendations, and how you’ve also added tips on how to find locals to tell you the stories. I would love to meet Edward McNamara! Thank you! It was a journey that changed me for sure. So many beautiful locations with history and legends. I remember looking at depictions of banshees when I was young and learning about their history. Would love to visit Ireland. I’ve been to the west coast a number of times on family holidays, mainly around Doolin, the Ring of Kerry, Dingle Peninsula – and those beehive huts! Amazing. But I’ve never been to Connemara; not yet. I love the history of the west coast, the wilderness, and the closeness with all the myths and legends – in this land you can easily believe them to be true. Oh the truth of these legends will consume you! I miss it terribly already. Heading back in October! Wooow! This really makes me feel like I’m in a fairytale! Oh thank you! So Glad you enjoyed it! I’m always searching out stories or legends of places I visit. I also love a dolmen and go to as many as I can find! Great article. That’s great, we should swap stories sometime! HAHA! My mom used to say that too. I don’t even think she knew what one was. Old New York women for you lmao. I’m glad you liked it! I learned even more awesomeness about Achill Island after I returned. I interviewed this lovely Transformational Coach and Bio-Energy Therapist Agata Nowicka. She shared with me all of the places where she feels the fairies on Achill. Sounds silly to some, but you’d be amazed at what she shared. HA! I have that problem as well. I’m glad you enjoyed the article. I’ve only been to Dublin and Cork; now I wish there’d been time on my trip to see some of these beautiful places you highlighted. Oh I’m so glad you think so. I can’t tell you enough how amazing the coastal regions are. Another really great site for anyone planning to go to Ireland is http://irishfireside.com Our buddy Corey is the jam! His site is everything Ireland! Achill Island looks absolutely stunning I need to look up Grace O’Malley, as her story sounds fascinating. Beautiful shots of the coastline! I’m telling it it’s awesome! May and September are the best months to visit. Grace O’Malley has sites from Westport to Achill, several castles that she owned and even a history in Howth and with Queen Elizabeth! A good one for sure! Amazing, thank you I am so glad you enjoyed it! Wow, these are some of the most beautiful pictures of Ireland I have ever seen! And I love the legend stories to go with them. I especially love the picture of that fuzzy sheep! Thank you Anna! i wish I had more time there. That was my second trip. I’ll be going back in October for the Game of Thrones Territory. I am wicked stoked about that! I love all of your photos, I can’t believe how blue the water is in that one photo, too! Aww that horse is adorable and looks super friendly too. It’s so cool to find places seeped with so much lore and stories. It makes you wonder how they got started in the first place. Wow, that is a hotel I’d like to go to 🙂 Thanks for the post, very informative! You’re welcome! Let us know if you ever get there! Hey. That is a great article presenting that part of Ireland. Photos are amazingly clear and great. I am in for adventures and this trip seems worth doing it. Thanks. Awesome photos! Tir na Nog is the name of an Irish pub where I live (Raleigh, North Carolina) so I’m pumped that you’ve solved that mystery for me and now I have some secret knowledge to share with everybody around here! Oh my goodness! A long time ago when I was doing some research, I came across that pub. I thought, “what a cool name for a pub”. I’m glad you now know the truth behind Tir na Nog! Surprise, it’s not just shotty spelling! It actually DOES have meaning LOL! Amazing post Christa and incredible photos! There are so many amazing places in the earth and you have just revealed to me one more! Thanks! Ireland is such a magical place. I’m heading down the country to experience these places you have mentioned this summer with my mother, her 70th Birthday present. Being from Donegal, it is my favourite, and so undiscovered, we’re on the edge of Europe and rife with ancient monastic sites older than stone henge and legends and lore a plenty. You should check out the Connecting Colmcille experience in August, we’ll be going on an archeological expedition and telling the story of Ireland. You would be most welcome as our guest of course. Great blog. I look forward to more adventures. Thank you so very much, I will be sure to come see you next time I am there! Again, thank you 😉 Ireland is where part of my soul is. Hi Christa, a wee question for you, or rather your opinion. I’ve just crafted a boutique adventure holiday for two American travellers, they’re into energy and and faeries. Its all in Donegal, Dunlewy, Glenveagh, Ardara, walking and ebiking, staying in boutique B&B’s, they don’t know yet but I’ve arranged local storytellers to meet with them in key places along the way, especially the pagan sites they’ll be passing. So my question to you, is what to call this experience. So far I have Footsteps, faeries and folklore. What do you think? With all your experience I thought I’d ask you … and you’ve been to these parts. They are so excited. This is all completely customised, so it deserves a title. You know. Moira – Thanks a million for any thoughts. HI there! So I’ve seen some things done like this before and it’s been along the lines of just that… Folklore, Faeries, Enchantment… Maybe Storytelling, Folklore and Fae in Enchanted Ireland. Sounds like a great trip. you nailed the spots too, although most of Ireland is enchanting!